Phenols and Brett - Initial Results! Everyone knows that malt extract is what gives beers that gross “homebrew” flavor. The reason is that the malt flavors become too concentrated and ummm… as a result becomes oxidized by the Maillard reactions during storage? Seriously though, most of the off-flavors many homebrewers remember from their early batches were a result of issues with the concentrated boil, sanitation, or fermentation. With a full boil and the benefits of an experienced brewer’s fermentation process, extract batches can be every bit as good as all-grain! However, what you gain in ease of brewing, you give up in control. As a result, malt extract is best used for beers in the middle of the fermentability spectrum, golden or darker, and not driven by a characterful base malt. While I’ve brewed a few delicious clean beers with extract over the years (like a hefeweizen and Belgian single), I’d never brewed a sour beer based on malt extract (although I have augmented with it). I decided to use it to evaluate the pack of Wyeast Oud Bruin Blend I had in the fridge. The blend, released as a summer 2014 VSS, combines brewer’s yeast and Lactobacillus. It is intended to turn out a drinkable sour beer in about two months, without attenuation as high as their similar De Bom Blend. This recipe was inspired by the cherry variant of our sour bourbon-barrel porter that our barrel group brewed in 2010. I steeped the specialty malts in 165F water to extract their flavor. Unlike all-grain mashes where the enzymes from the base malt convert the dextrins in specialty malts (including caramel/crystal) into fermentable sugars, extract based beers retain these unfermentables into the fermentor. Hopefully those long-chain sugars provide some sweetness and body to balance the mild roast from the chocolate rye and ~300L roasted barley. For extracts I opted for rye LME and wheat DME. The extra proteins in each should help fortify the body. Instead of sour cherries I selected 3.75 lbs of frozen blackberries. Blackberries don’t impart as distinct a flavor profile as cherries or raspberries. They are more generically fruity/winey, meaning they integrate without dominating. I had great luck with them in my first batch of Flemish red. I also tossed in a pound of beach plums harvested from my parents’ backyard (just a few yards from the mead pit). Instead of bourbon, I added oak cubes soaked in calvados along with one ounce of the remaining oak-infused liquor. It should be a unique flavor combination if nothing else! I’ve got ingredients for an extract lambic I'm planning to brew soon as well! Closer to my standard fermentation process, and leaving the extract flavor a bit more exposed. 0.50 oz. Czech Saaz (Pellet, 3.50% AA) @ 35 min. Steep - 165 F for 30 min. Stepped crushed specialty malts in 3 gallons of water starting at 165F for 30 minutes. Topped off with more filtered tap water with 2 g of CaCl. Chilled to 73F. Shook briefly to aerate, pitched the yeast blend directly from the package. 11/10/14 Transferred five gallons of tart stout onto 3.75 lbs of frozen Whole Foods organic blackberries, and calvados soaked oak (6 cubes plus 1 oz of the steeping liquid)! 11/14/14 Added 1 lb of frozen beach plums harvested on Cape Cod in September. 12/16/14 Moved to basement. Around 50F, likely cold enough to preserve some sweetness. 1/29/15 Kegged, force carbonated. FG 1.012 (78% AA, 5.7% ABV). pH 3.67. 3/5/15 Tasting notes. Not as dark or stout-flavored as I expected (too light on the dark malts, and steeping less efficient than I expected). Otherwise nice lactic acidity and good fruit flavor. Enough sweetness to balance the malt and blackberries. I see now. Great post. This has inspired me to go for it! Thanks! Great post. Did you do anything else to the blackberries prior to adding them (like attempt to sanitize them)? I see a lot of conflicting info out there on the subject. 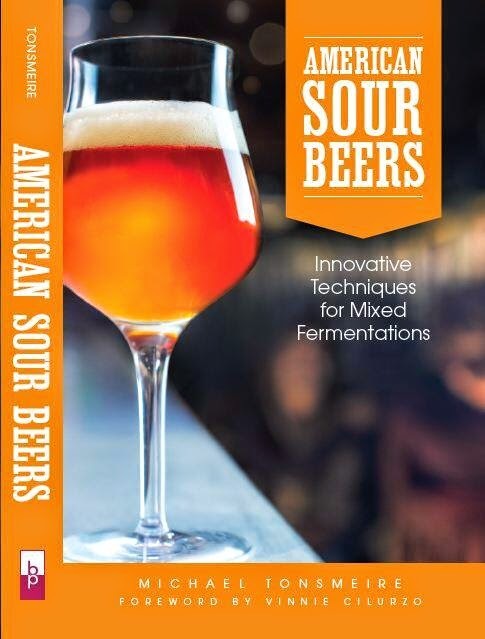 For a sour beer, pretty much all the major beer spoilage microbes have already been intentionally introduced. Between the alcohol, acid, and lack of residual carbohydrates there aren't many microbes that can cause problems. As a result, I just dump the frozen fruit into the carboy, let it defrost for a few hours, then rack beer onto it. For a clean beer the risk is more substantial, sanitation becomes a much more important consideration. Can it stay at 73 degrees throughout fermentation and aging? Any plans to re-use the yeast on anything? What temperature do you generally keep your sours at long term? We're starting a solera but being in Australia we're going to climate control the whole thing. Wyeast actually says the ideal range for this blend is 80-85F. The higher temp is to favor the Lactobacillus. I don't have the ability to age it that warm this time of year, but I kept it by the radiator for the first month. Most of my sours age in the mid-60s at warmest (cooler this time of year). No plans to repitch the Oud Bruin Blend, I've got a serious backlog of microbes to try out as it is! Understandable, plenty of bugs etc. out there to try/use. Definitely interested to see what this does dow something like a porter or stout. I have a vial of Brett C as well, I I ran with a standard style porter recipe, and threw this blend with the brett C, this would work ok? Depends what your goal is. The Brett C will probably take 6-9 months to stabilize the gravity, which will be considerably lower than it would have been without Brett. I'm interested to see how this turns out. I have heard less than stellar things about the Oud Bruin blend. I'm wondering if you ever got around to using the De Bom blend? I made a sour pumpkin beer with it that turned out alright, but it's mostly just straight-up lacto sour without too much complexity. But I'm thinking there can be a lot of variability from batch to batch based on how people oxygenate their wort and what temperature they ferment it at. I have a batch fermenting with De Bom, but still too young to make any real judgements. I just hope the gravity stabilizes as quickly as they claim! Great post! you mention that the Oud Bruin blend makes a drinkable sour in two months. Do you plan to age it longer than that, though? Not much longer anyway. I'm planning to get this one once the saison I have on tap kicks. It's actually sitting cool in the cellar already, hoping to preserve the fruit flavor and some sweetness by slowing fermentation. did the tartness ever come around on this? Decent tartness. I actually have the beer still sitting on fruit in the basement. Hoping to preserve some fruity-sweetness to go with the tartness. Waiting for a spot on tap to free up. Roeselare is a mix of microbes designed to produce sour beers with longer waiting times than the Oud Bruin Blend. If you are kegging, you can keg whenever the flavor reaches a point you are happy with. However, if you are bottling you'll need to wait for the gravity to be stable month-over-month, or risk over-carbonation. Might only be six months, but could be longer. The Rye LME is 70% "Base Malt" 20% rye and 10% crystal 40 according to Briess. The Wheat DME is 65% Wheat and 35% barley according to Muton's. So I'd swap in: 5 lbs pale, 3.25 lbs wheat malt, 1 lb rye malt, and .5 lbs crystal 40 (assuming 70% efficiency). Did you ever keg this? I'm curious how this tastes because mine is still in the secondary and I cannot wait to start drinking this batch. Yep, my most recent post. Check the link at the bottom of the post! What changes would you make to the steeping grains and improve the color and make it more stout like? Wouldn't hurt to swap out the Briess 300L roasted barley for a more typical 500L version from another maltster. Let me know how it turns out! Hey Mike, seeings how the PC Oud Bruin blend is pretty much unavailable everywhere, do you have another suggested yeast that will sour it as fast (or close to it) as the Oud Bruin blend? I'd like to have this beer ready to go by November so I can't really go with the 3763 Roeselare blend. Thanks.